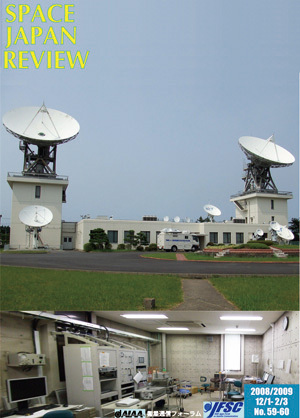 Earth station for satellite communication experiments, located in NICT Kashima Space Research Center, Ibaraki Prefecture, Japan. A van parked in front of the building is an experimental vehicle for the WINDS satellite. The photo below shows an experimental room for the WINDS. New Year Greeting from SJR Editorial Committee Members. In May of 2008, the American Institute of Aeronautics and Astronautics hosted a forum in Washington, DC entitled "Working Together to Build the Aerospace Workforce of Tomorrow." The forum identified that the shortfall is not unique to the United States but also is a challenge in Japan and Europe. What should we do to create the global aerospace workforce and rekindle the passion for aerospace? President George K. Muellner of AIAA gives the executive comment for Space Japan Review. In terms of international space cooperation and collaboration, analyses in many symposia, conferences and papers "typically address management of the classical parameters (cost, schedule, performance) which is no longer sufficient without also managing the political climates which impact collaborations. I extend these parameters even further by addressing collaboration from a broader perspective of the likely global trends, market influences and resource considerations." Talks Vice President Vincent C. Boles of AIAA. The importance of satellite communications for national security and how to lead the research are discussed, based on that the Space Basic Law is concluded recently in Japan. It is described that the Revolution in Military Affairs (RMA) advances and the satellite communications increases its importance as a pivotal technology of the RMA referring to its utilization of the United States armed forces based on unclassified documents. It is also described that the different points from conventional method in research are not to let researchers to think how to use their research results, not to squeeze the research items, and to become more important for the government to conduct the research of satellite communications. Japanese TCCS members participated in the AIAA TCCS (Technical Committee on Communications System) meeting, which was held at Marriott World Center located in Orlando, Florida at 9:00 a.m. EST on January 5, 2009, with telecon. Plans for ICSSC-2009, -2010 and -2011 were discussed, and the activity of Japan Forum by using a handout document attached in the end of this article was explained.